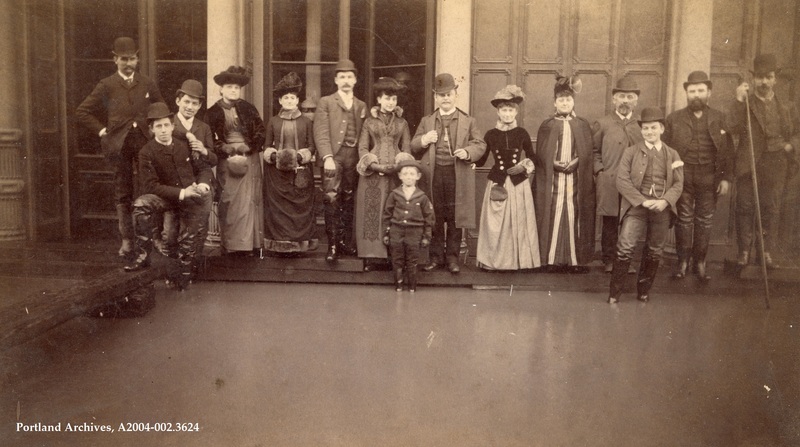 Men and women posing during the 1890 flood. City of Portland (OR) Archives, A2004-002.3624. Very seldom to see even one person smiling in early photos’, but five? And during a flood ? Liz C: At first I thought the boy in the sailor suit belonged to the couple on the left, then I too noticed that he looked more like the couple on the right; he was standing nearer his father. This superb photo really captured the individual personalities of these folks. You can almost anticipate the boy’s parents admonishing him not to splash in the water with his feet. Fur was very popular with the ladies. All dressed up for the flood! Looks like rubber boots were an essential in Portland. I keep trying to feminize the last women on the right and I just can’t do it. The person doesn’t resemble a female at all. It looks like a man. That sort of dress couldn’t have been acceptable for a male in public back then could it? Too much work back then to get dressed. LOL. No tees, loafers etc. Administration…won’t post my entries until I close out browser and reopen. I tried to contact you the correct way by clicking on “contacts” but even that wouldn’t work. Said I needed a “correct URL”.